Directed by John Tuturro, the plays Talking Cure by the Coen Brothers, George is Dead by Elaine May, and Honeymoon Motel, by Woody Allen, revolve around dysfunctional families. The show’s high points, sadly, were confined to May’s George is Dead. George is Dead is about Doreen, a spoiled city wife played by Marlo Thomas, who, upon hearing her husband is dead, rushes over to the apartment of Carla, her former nanny’s daughter. Carla has little idea what to do with the oblivious, selfish woman. Doreen, pampered all her life, is unwilling to make funeral arrangements. We see later, though, that Doreen is actually in denial. She descends into childlike shock, at one point sitting in pigtails and a nightie clutching a pillow, so refusing to move that Carla actually has to call her 90-year-old mother, out of nannying for many years, to come get Doreen into “our nice dress” for the funeral. Eventually we see Doreen stripped of her spoiled nature, sobbing over her husband’s coffin. The scene is far-fetched but poignant. Thomas is lovely as Doreen and Lisa Emery is a great foil as Carla, but the story itself lacks in certain places. There is a subplot of Carla’s husband leaving her that could easily be removed from the play without diverting the course of Doreen’s far more interesting story. It felt like May was trying to cram too much into too a small space. Overall, the play was certainly funny and heartfelt, if at times a bit exaggerated. Honeymoon Motel, by Woody Allen, was also disappointing. It’s the story of Jerry, the groom’s stepfather, and Nina, the bride-to-be, running off together to a motel in the middle of the wedding. The immediate families of each show up and bicker about the perverted situation. Ultimately, a “wise” pizza man mediates, calming everyone down and leaving the obviously-in-the-wrong Jerry and Nina together. The play was filled with innumerable, played-out Jewish stereotype characters speaking in cheap jokes. It was surprising to see such a lack of original humor from Allen, who normally does insightful comedy and dialogue so well. It should have been delightful to see the work of such playwrights on stage. Instead, one has to wonder how quality writers produced works that don’t stand up to their names. 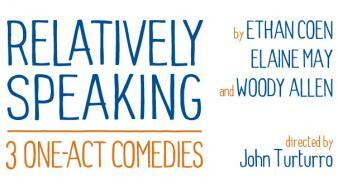 Relatively Speaking: 3 One-Act Comedies opens October 20 at the Brooks Atkinson Theatre. For more information and to purchase tickets, please visit http://relativelyspeakingbroadway.com/.